Dive 11 World War Two Japanese wrecks at 12 to 43 meters, caves, 2 geothermal hot lakes, coral reefs and walls. Diver training through advanced nitrox and wreck penetration. ...Learn to dive in warm, calm, crystal clear water. Dive 11 World War Two Japanese wrecks at 12 to 43 meters, caves, 2 geothermal hot lakes, coral reefs and walls. Diver training through advanced nitrox and swreck penetration. Learn to dive in warm, calm, crystal clear water. PADI Dive Center Dive Right-Coron makes daily trips for two or three wreck dives. Coron is well blessed with a wide range of dive sites to suit all tastes and levels of experience, from shallow pristine reefs to advanced wreck diving. Full details and wreck drawings can be found here. Water temperature is 27 to 30 C or 80 to 86 F. Using a 3 mm one-piece wet suit with gloves is Dive Right's recommendation for Coron's wreck dives. Some cave, reef, wall and wreck dive sites are in the open ocean giving 20+ meters visibility. The two hot lakes have 20+ meter Viz. Six big wrecks in Coron Bay have visibility that varies with the strength of the tidal flow. The area between the Philippines, Malaysia and Indonesia has been been stable longer than any other ocean region on Earth giving marine organisms a chance to develop in more diverse forms than any other marine region. Diving on Nitrox is for depths from 16 to 45 meters. It is not a gas for deep dives. Within appropriate depth limits Nitrox will allow increased No Decompression Limits, shorten Surface Intervals, or decrease your Decompression Requirement. Dive Right-Coron offers both PADI and TDI Nitrox Diver training courses. Make your Nitrox Diver training dives on the wrecks and enjoy more bottom time. Dive Right-Coron teaches through TDI Advanced Nitrox Diver and supports technical divers making any dive that they are trained for. Dive Right-Coron can provide stage cylinders for high O2 decompression gases. Dive Right can provide dive lights and reels and a wide variety of equipment for the traveling technical diver. Not sure you want to dive on wrecks. After 55 years underwater the wrecks are coral reefs with their own resident fish populations. Compared to wrecks in British waters these are intact, have no appreciable current, and have good visibility. Yes! We can teach you how to dive! Besides being good divers themselves, our PADI and TDI instructors have been trained to teach you. Bring your swimsuit. We provide everything else. 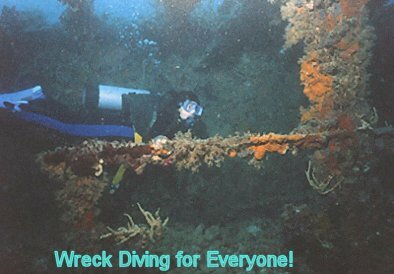 The wrecks are a GREAT place for advanced diver training. The 5 training dives for the PADI Advanced Open Water Diver Course can be done on the wrecks. Nitrox Diver and Wreck Diver Specialty Courses can be integrated with advanced training or done separately. Want to become a PADI Open Water SCUBA Instructor? Dive Right-Coron teams up with the most experienced PADI Course Director in the Philippines to offer PADI Open Water SCUBA Instructor Training for $950 US! If you happily embraced the concept of a "Safety Stop" then here is additional information you must be aware of. A must for older divers, deep divers, and divers doing decompression diving. Any diver traveling to remote and exotic diving locations where you can't call a Coast Guard helicopter or Emergency Medical Services MUST READ THIS! Seven of the 11 wrecks were major ships longer than the 118 meter armed seaplane tender, "Akitsushima". Click Coron's Dive Sites for pictures of all of the wrecks. 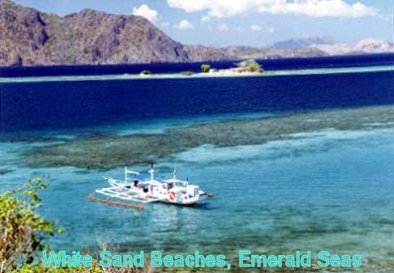 Coron is a small fishing and trading town on Busuanga Island in the Calamian Island Group Southwest of Manila. Coron is off of the regularly travelled tourist path. Since the people here don't make their living off of you they don't hustle you non-stop like on Boracay. You won't feel like you are in an over-developed tourist ghetto. No need to dodge crowds of "package tour" tourists. Coron has remained quiet through all of the trouble on the flyspeck islands of Basilan, Tawi Tawi, Sulu and Jolo in the far south below Mindanao. Right now the Philippine Army has the dissident Muslim rebels trapped on Basilan Island. 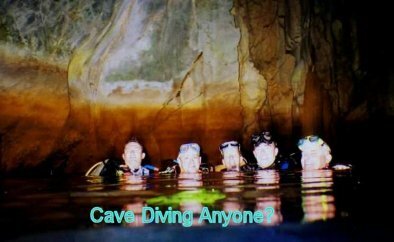 Dive Right-Coron is located in Coron Town, on Busuanga Island, in the Calamian Island Group. If it's information you need, it's here. You can get more information by clicking on the links on the left and right sides. Beautiful emerald and turquoise seas. White sand beaches. Towering limestone cliffs. The day trip for diving is worth the scenery alone. 14 meters, deck of Okikawa Maru. Everyone can dive outside the wrecks and enjoy beautiful corals and abundant fish life. Hour long dives are common. A once in a lifetime dive. You'll never forget this diving experience. American carrier based fighters and bombers flew almost 600 km to pull off a surprise attack on Japanese ships which had assembled in Coron Bay. The ships sunk in this attack litter the bottom of Coron Bay. Fifty six years has turned them into coral reefs with their own resident fish populations. Choose from a Bed n' Breakfast, a Garden Resort, a Lodging House built over the water, and a Beach Resort. Mosquitos with Malaria are not a problem on Busuanga Island in the Calamian Island Group. Drink bottled water and eat in the tourist restaurants and you won't have a problem. Prevent sunburn! Coron can be reached by Air. Depending on the day of the week, there are three to four daily 55 minute flights from Manila. Airlines serving Coron have a 10 kg limit for checked baggage. Baggage over 10 kg will be charged an excess baggage fee of $1 US per Kg. A group of divers with full dive gear definately need to read more. 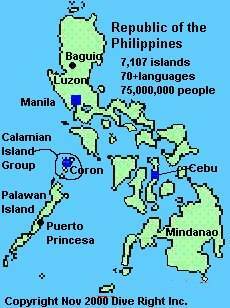 Coron can be reached by Sea. There are several sailings from Manila per week. The ship leaving Manila at 4 PM on Friday is "Tourist Class". Book outgoing calls and FAXs at Globe and RCPI pay stations. Check your e-mail at one internet cafe. SMART now has one GSM cell-phone tower in Coron. .
Money changing is available for $US but at a rate lower than in Manila. Payment by Credit Card costs an additional 6.5%. Night life in Coron is pub style. There are a limited number of tourist restaurants which also provide music and alcohol. Night life is conversation with other divers while sitting around your drink and listening to music. There is a small disco in town. Information about transfer from the International Airport to the Domestic Airport. Also transfer information to the most frequently used Manila hotels. Your trip to Coron may require an overnight stay in Manila on arrival or on departure. Here are clean safe hotels and pensions in all price ranges. All have been used by Dive Right's divers in the past with great satisfaction. A price list for diving, lodging, and per day packages. If you want the security of a bonded travel agent in your home country here are the agents we work with. If you want to send an e-mail to Dive Right-Coron please click here.